Most people who have been struck by a semi-truck do not have the financial resources to pay a lawyer who charges by the hour, and cannot take the risk of losing the money invested in a legal case. For this reason, the vast majority of attorneys charge on a contingency fee basis for all personal injury cases. This allows victims to get the legal representation they need without paying any costs up front. If the attorney does not win the case, the victim does not have to pay any fees at all—and if the case is successful, the attorney will take a portion of the victim’s recovery as payment. In Illinois and Missouri, there are no limits on the percentage allowed as a contingency fee in personal injury cases, as long as the fee is considered “reasonable.” However, lawyers and clients must agree on a percentage and sign a written fee agreement in contingency fee cases before the attorney begins working on the case. Expenses. Most personal injury lawyers will pay for expenses incurred throughout the case, such as court costs, accident scene investigation, hiring expert witnesses, travel expenses, mail and copying costs, and creation of court exhibits. These are usually paid back to the attorney after the case has been resolved. Effort. 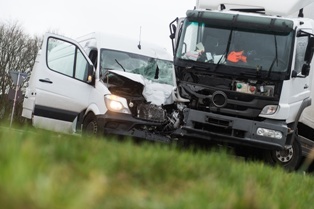 Tractor-trailer accidents can be extremely complex, involving the intersection of state and federal laws and the interpretation of trucking company regulations. This can require a lot of a law firm’s time and effort—and the more time devoted to the case, the higher the percentage an attorney may charge. Trial or settlement. Court cases can take much longer to resolve than cases that settle in negotiation. Law firms may include a stipulation in the fee agreement that allows them to collect a different amount based on whether the case settles or proceeds to trial. Our attorneys have successfully represented individuals throughout Illinois and Missouri who have suffered serious personal injuries. We listen to your concerns and provide clear options for your next steps, giving you the personal attention you need throughout your case. Simply fill out the short contact form on this page to schedule an appointment for a free consultation, or download your FREE copy of one of our books, When the Rules of the Road Get Broken: A Guide to Illinois Car Wreck Cases or The Missouri Car Crash Guide: Don't Wreck Your Car Crash Case! Are there laws preventing commercial truckers from driving distracted? 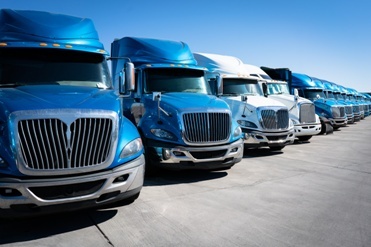 Commercial truck drivers are not just expected to make their deliveries on time, they also have to complete a variety of non-driving activities to remain compliant with the law. Unfortunately, attempting to complete these actions while driving is a common form of distraction—especially if they involve cell phones or smartphones. Truckers may also attempt to pass the long hours behind the wheel by talking or texting, increasing the risk of an accident. Texting and talking on cell phones are a major source of distraction for drivers, including those hauling two-ton trailers. A truck driver who takes his eyes off the road for three seconds may not be able to stop to avoid a hazard, potentially leading to injuries and deaths to the passengers of smaller cars. Federal laws. The Federal Motor Carrier Safety Administration (FMCSA) has banned texting and driving for operators of commercial motor vehicles (CMV). The law covers a variety of distracting behaviors that require “manually entering alphanumeric text into, or reading text from, an electronic device.” A trucker who is caught dialing a cell phone, entering text, reading messages, or even reaching for a phone can face a fine of up to $2,750 and suspension of his or her commercial driving license (CDL). Illinois laws. Illinois law prohibits drivers of both commercial and passenger vehicles from reading, writing, or sending text messages from behind the wheel when the vehicle is in motion. 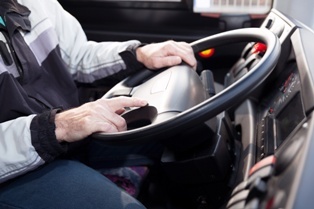 Commercial vehicle drivers are only permitted to talk on the phone if they are using an acceptable hands-free device. If commercial drivers are caught breaking this law, they may be ordered to pay a penalty fee of up to $2,750. If a distracted driving crash results in great bodily harm, disfigurement, or permanent disability, then the driver can be convicted of a Class A misdemeanor. However, if the accident results in the death of one or more victims, a driver can be convicted of a Class 4 felony and face a fine of up to $25,000 and between one and three years in prison. Missouri laws. Using a cell phone while driving is only illegal for Missouri bus drivers and drivers under the age of 21. However, commercial truckers are still bound by FMCSA laws restricting cell phone use even in states where electronic devices are permitted. Even if the trucker’s specific actions were not illegal under state or federal laws, there are many driver distractions that can be seen as negligence. If the trucker was reading a paper map, typing directions into a navigation system, or watching a video on a portable device while driving, you may be entitled to compensation for your injuries and loss of income. Simply fill out the short contact form on this page to schedule an appointment for a free consultation, or download your FREE copy of one of our books, When the Rules of the Road Get Broken: A Guide to Illinois Car Wreck Cases, or The Missouri Car Crash Guide: Don't Wreck Your Car Crash Case!